US President Donald Trump has issued an executive order banning citizens of seven predominantly Muslim countries, namely Iraq, Syria, Iran, Libya, Somalia, Sudan and Yemen, to enter and visit the United States for 90 days and to suspend the admission of refugees. The decision is clearly detrimental and perpetuates the suffering of the people coming especially from those countries accused of being sponsors of terrorism. Previously, on January 25, 2017, Trump issued a decree relating to the construction of the 2,000-mile-long, 12-meter-high wall at a cost of more than 8 billion US dollar, or 106 trillion rupiah. The objective is to prevent illegal immigrants from entering US and drug smuggling. The construction of the US-Mexico border wall is a continuation of the implementation of the 2006 Border Security Act, backed by Obama and Hillary Clinton, as senators. During the Obama administration, 2 million Latino residents who had crossed the border were deported. It was the largest deportation in the history of the United States. Trump wants to continue deportation with greater intensity and threat those who offer protection to undocumented workers and refugees. Trump’s immigration policy criminalizes refugees, immigrants, and Muslims, using them as a scapegoat and turning them into the cause of terrorism, criminality and drug trafficking in the United States. In fact, the United States is the main source of the crisis, poverty, unemployment and refugees. Refugees and immigrants were and are victims of the aggression and plunder of the US-led imperialists, destabilization, and neoliberal economic policy under the US government of both Democrats and Republicans. It is the root of the global crisis of refugees and forced migration. The Trump Administration is supported by the global oil monopoly entrepreneurs, who had gained enormous profits following the invasion launched by the former administration of George W. Bush. They used Islam phobia to provoke a crisis that justified one war after another and marked Iran as the next target. In fact, Trump continues with anti-Islamic hysteria and the War on Terrorism prompted by the administration of George W. Bush since the attack of September 11, 2001 (9/11) in order to launch wars of aggression aiming at plundering natural resources. The seven countries whose citizens are barred from entering and visiting the United States have been bombed, vandalized and destroyed because they have large reserves of oil and natural resources coveted by the US. In fact, Donald Trump was elected President of the United States in the midst of a campaign against immigrants, refugees, and the poor, intensifying racism, xenophobia, neo-fascism, misogyny and sowing fear. Donald Trump along with a handful of elite and corporate giant is trying to divert the popular anger in the US from the true culprits towards the Muslims and the immigrants. It is a way of creating multiple benefits for the elites and corporations at the cost of the exploited and oppressed working class and people of the world. Even in Indonesia, as reported by online media, Donald Trump has a plan to build Trump International Hotel and Tower Bali which would offer views of the Indian Ocean and Tanah Lot Temple. The project would cement ties between Trump’s family and the founder of the MNC Group, Hary Tanoesoedibjo. Obviously, Donald Trump’s corporate investment would be constructed on the community lands robbed by the big landowners. His policy will certainly accelerate the expropriation of land in Indonesia and other semi-colonial countries as a rescue from the crisis of the system of monopoly capitalism. 1. Freedom for the citizens of the seven countries still being held by US immigration authorities; Grant them permission to visit, study and work, respect the right to live and be protected of the refugees. 2. Immediately repeal Donald Trump’s Executive Decree issued on January 25, 2017 for being discriminatory, anti-immigrant and anti-Muslim. Immediately repeal the project of continuing the construction of the border wall between the United States and Mexico. Stop all forms of criminalization of refugees and immigrants of the United States government. 3. Reject any form of intervention and war of imperialist aggression against the countries that defend the sovereignty of their nation, using as pretext terrorism and war against terrorism, inciting hysteria against Muslims, in order to plunder and expropriate their natural wealth and to control the country political, economic, cultural and militarily. 4. To demand the Jokowi government to protect Indonesian citizens living in the US who are threatened by the discriminatory anti-Muslim and anti-foreign policies that are growing in the US since Donald Trump came into office. The Jokowi government must be responsible for providing protection to Indonesian citizens as well as migrant workers in the US and other countries. Most of them work as migrant workers to improve their lives because the chronic crisis is getting worse in Indonesia and offers no prospect of livelihood. 1. Unite and provide solidarity to our Muslim immigrant brothers, victims of the abominable imperialist policies of the Donald Trump government. 2. Fight against all American schemes and imperial policies intended to undermine the sovereignty of the nation through intervention, wars of aggression, and the politics of neoliberalism. 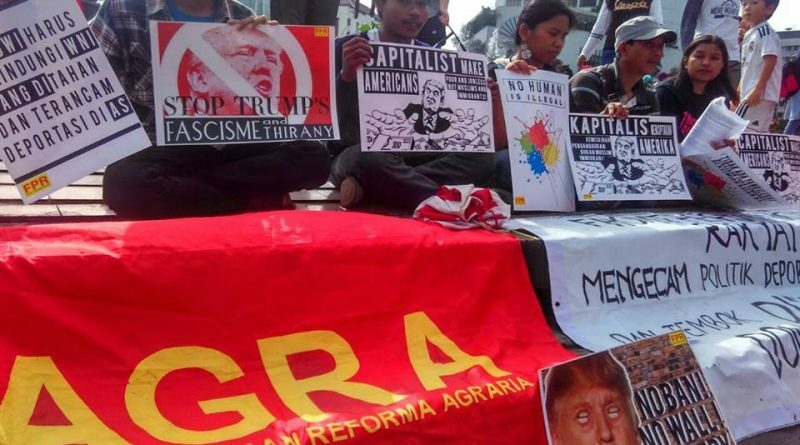 Oppose all Jokowi-JK government policies that implement the US neoliberal scheme striving to dominate and plunder the nation and the motherland. ← ILPS-US: We Stand with Muslims and Immigrants!